We are the Flower Preservation Professionals! We are known for our specialised professional services in flower preservation for all occasions. Weddings, Memorials and all events of importance to you. Our products are made of high quality materials and workmanship and we take great care in looking after your flowers so that they are returned to you just as they were sent. 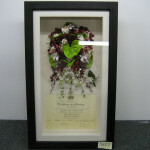 Brisbane, Sydney, Melbourne, Adelaide, Perth, Gold Coast, ACT, Tas, NT or where ever you maybe in Australia we can preserve and frame your memories.